The sources of drinking water (both tap water and bottled water) include rivers, lakes, streams, ponds, reservoirs, springs, and wells. As water travels over the surface of the land or through the ground, it dissolves naturally-occurring minerals and, in some cases, radioactive material, and can pick up substances resulting from the presence of animals or from human activity. The City of Mansfield purchases lake water from the Tarrant Regional Water District (TRWD). 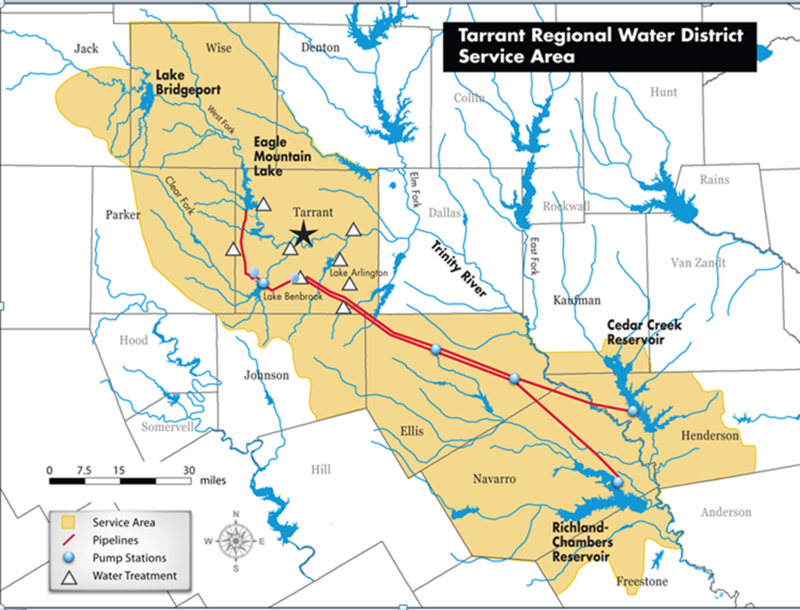 TRWD pumps water primarily from Cedar Creek and Richland Chambers Reservoirs in the east and Lake Benbrook in the west. A Source Water Susceptibility Assessment for your drinking water source(s) is currently being updated by the Texas Commission on Environmental Quality (TCEQ). This information describes the susceptibility and types of constituents that may come into contact with your drinking water source based on human activities and natural conditions. The information contained in the assessment allows us to focus source water protection strategies. For more information about your source(s) of water please refer to the source water assessment viewer available at the following URL: http://www.tceq.texas.gov/gis/swaview. Further details about sources and source water assessments are available in Drinking Water Watch at the following URL: http://dww2.tceq.texas.gov/DWW/. City Council – 2nd / 4th Monday of every month at 7pm, City Hall, 1200 E. Broad St.
En Español: Este reporte incluye informacion importante sobre el agua para tomar. Para obtener una copia de esta informacion traducida al Espanol, favor de llamar al telefono 817-477-2248. Drinking water, including bottled water, may reasonably be expected to contain at least small amounts of some contaminants. The presence of contaminants does not necessarily indicate that water poses a health risk. 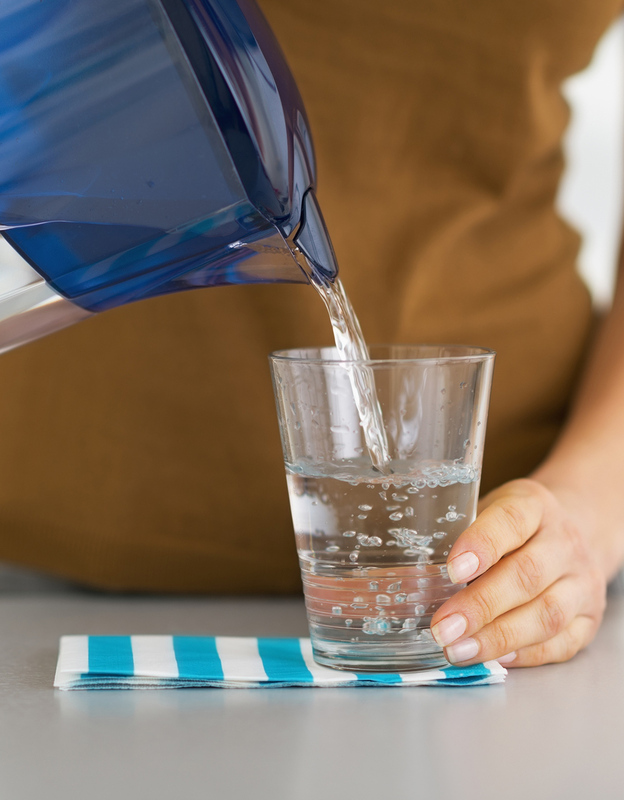 More information about contaminants and potential health effects may be obtained by calling the Environmental Protection Agency’s Safe Drinking Water Hotline 1 (800) 426-4791. Inorganic contaminants, such as salts and metals, which can be naturally-occurring or result from urban storm water runoff, industrial or domestic wastewater discharges, oil and gas production, mining or farming. Pesticides and herbicides, which may come from a variety of sources such as agriculture, urban storm water runoff and residential uses. Organic chemical contaminants, including synthetic and volatile organic chemicals, which are by-products of industrial processes and petroleum production and can also come from gas stations, urban storm water runoff, and septic systems. Radioactive contaminants, which can be naturally-occurring or be the result of oil and gas production and mining activities. In order to ensure that tap water is safe to drink, EPA prescribes regulations which limit the amount of certain contaminants in water provided by public water systems. FDA regulations establish limits for contaminants in bottled water which must provide the same protection for public health. Contaminants may be found in drinking water that may cause taste, color, or odor problems. These types of problems are not necessarily causes for health concerns. For more information on taste, odor, or color of drinking water, please contact 817-477-2248. You may be more vulnerable than the general population to certain microbial contaminants, such as Cryptosporidium, in drinking water. Among those who could be at risk from infections: infants, some elderly or Immuno-compromised persons such as those undergoing chemotherapy for cancer, those who have undergone organ transplants, those who are undergoing treatment with steroids and people with HIV/AIDS or other immune system disorders. You should seek advice about drinking water from your physician or health care provider. Additional guidelines on appropriate means to lessen risk of infection by Cryptosporidium are available from the Safe Drinking Water Hotline (800-426-4791). What causes taste and odor in my drinking water? Hot South Texas summer weather results in a rapid algae growth in our surface water reservoirs. As the algae decay, they release taste and odor compounds. The Mansfield Water Treatment Plant replaced the anthracite coal filter media with GAC (Granulated Activated Carbon) in the plant expansion of 1999. As a result, the tastes and odor nuisance was greatly reduced. However, there are times of the year when the algae growths can exceed the GAC’s ability to remove the tastes and odors completely. In as much as the problem of taste and odor may be apparent in the water, the water is safe to drink. Is my water safer with water purification devices? Water from the City of Mansfield is safe to drink. We recognize it is your personal choice to purchase water purification devices. They have been known to cause problems in the quality of drinking water due to the lack of proper filtration replacement. These devices are not tested or regulated by the state or federal government. Do we have hard water? Hard water is defined by the amount of calcium and magnesium present in the water. Hard water has a relatively high level as compared to soft water which has a low level. Actually our water is not classified as hard or soft. It is medium (hard) and normally has a between 90 to 120 mg/l, or in other terms about 5 to 7 grains of hardness. Why does my water seem cloudy? Water that is cloudy is often the result of air in the water. To verify the cloudy water is caused by air, fill a clear glass with water from your faucet. Watch the glass closely. If the glass gets clear from the bottom to the top after a few minute then there is air in the water. While the quality of water is not affected by presence of air, it could be indicative of a problem in the distribution system. Excessive air in your water should be reported to the Water Utility Department by calling (817) 473-8411 or (817) 477-2248. What is causing the staining of my plumbing fixtures? Iron and manganese can cause a brownish orange staining on plumbing fixtures. The level of iron and manganese in our raw water is enough to cause staining problems. Since December 2003 Mansfield has been using Chlorine Dioxide to reduce iron and manganese. Avg – Regulatory compliance with some MCLs are based on running annual average of monthly samples. The highest level of a contaminant that is allowed in drinking water. MCL’s are set as close to the MCLG’s as feasible using the best available treatment technology. The Level of a contaminant in drinking water below which there is no known or expected risk to health. MCLG’s allow for a margin of safety. The highest level of a disinfectant allowed in drinking water. There is convincing evidence that addition of a disinfectant is a necessary for control of microbial contaminants. The level of a drinking water disinfectant below which there is no known or expected risk to health. 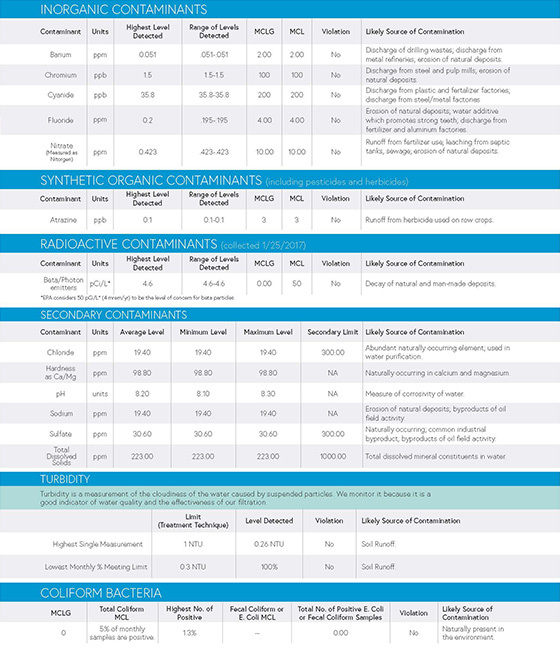 MRDLG’s do not reflect the benefits of the use of disinfectants to control microbial contaminants. NTU – Nephelometric Turbidity Units This is used to measure water turbidity (clarity). The level of a contaminant in drinking water below which there is no known or expected risk to health. ALG’s allow for a margin of safety. The concentration of a contaminant which, if exceeded, triggers treatment or other requirements which a water system must follow. This is a measure of radioactivity in water. Equivalent to one microgram per liter- or one ounce in 7,350,000 gallons of water. Equivalent to one milligram per liter- or one ounce in 7,350 gallons of water.